Where were we...? Oh, yes, last time I found time to pen an entry we had just moved into our new house. We've now been here nearly 6 months and it's really been such a treat. We have space to have friends over, which has been wonderful. By the 2nd half of Summer we were having friends over after weekly local criterium races -- Wine Wednesdays! This weekend we're having 5 of my running friends stay here while they're in the area for the wedding of 2 of our friends. We're also running a local half-marathon on the morning of the nuptials! Having 2 guest rooms makes this possible...we had NO guest space at the old place (which we still have yet to put on the market, but as Fall quiets down we'll be in a better place to get that in the works). My helmet's not crooked, it's jaunty! 3 days ago we arrived home from our JDRF Ride to Cure weekend in Nashville. What a fabulous time with >500 friends and fellow cyclists. And this single event raised a record-setting $1.5 million to fund scientific research towards curing a deadly autoimmune disease!! I managed to roll some of the miles of that 104 mile day with some Nashvegas-area friends, too, which was a major bonus! 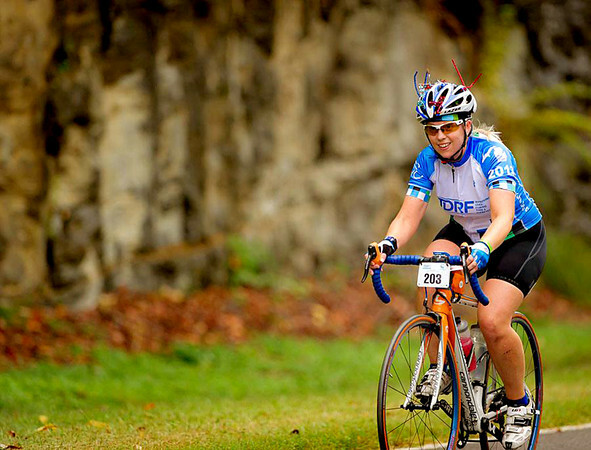 Each JDRF destination ride has been an amazing experience -- this year's ride was no exception. The sheer size of it was particularly awe-inspiring. This new Nashville ride was the largest in Ride to Cure history. Our team head coach received a special award honoring his years of selfless service to the program. That was the cherry on the top of the weekend's warm-fuzzies. Earlier this Summer DH and I joined a newly forming local cycling race team, 3rd Coast Racing. We've got a really great group of teammates...and all different disciplines and strengths, but universally fun people with a common love of 2 wheels. Some of us excel at criteriums, many of us participate in cyclocross (yeah, it's that time of year, again, so I will be covered in bruises until about Thanksgiving! ), mountain biking, time trials, gravel road epics, and a few of us love us some dus and tris. My 3rd duathlon of the year is coming up in about 10 days. For all intents and purposes it's an olympic distance race. I did my first longer-course duathlon in July, so I'm really looking forward to this, especially after my strong century in Nashville. The 26 "hilly" local miles of this bike leg should be a piece of cake! In a recent sprint race I placed 5/32 overall women and 2nd/9 in my age group. DH and I are also going to do our first race on the tandem (it's only recently that I'm a fan of it -- saddle and fit issues made it a very miserable experience for me in the past) in Nov. A gravel road race...OK, I feel sorta queasy just typing that, for realz!! We should have our team "kit," by then. It will be fun to represent 3rd Coast Racing as a married couple! Speaking of 3rd Coast -- it's not just a race team. 3rd Coast is also a "coming soon" bike shop -- 3rd Coast Cycles. DH and I are are co-owners with 3 friends. Any time you're in West MI come check us out (our shop will be located next to the Family Fare grocery store in Hudsonville, MI). Our shop motto is "For cyclists, bicyclists." We hope to be open on or around 12/1. This is a pretty quick-and-dirty update. We keep waiting for life to settle-down, but it seems like every week leaves us feeling like we're chasing our tails and out-of-breath. It used to be once the snow fell that cycling season would ease-up, but now there are fat bike races and indoor cyclocross events and The Sufferfest indoor trainer workouts in basements with friends. So much for an off season! !